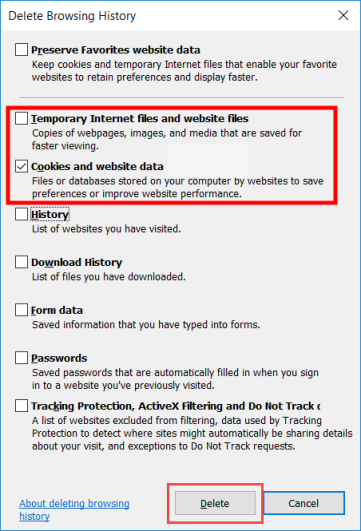 The process for clearing your internet cookies varies from browser to browser. Below, click on the internet browser you are using for instructions on how to clear cookies from that browser. Open Google Chrome to any webpage. For Windows users, press Ctrl + Shift + Delete on your keyboard. For Mac users, press Command + Shift + Delete. This will pull up a brand new tab with a screen that says Clear browsing data. In the Time range drop down menu, select All time. 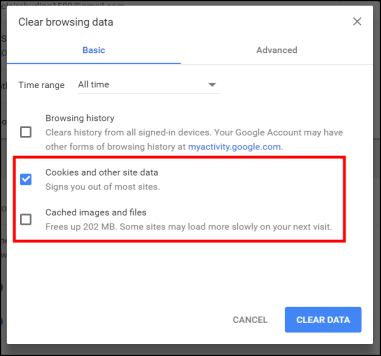 Chrome will work in the background to clear your data. It will not tell you when it is finished; simply wait a moment, then close Chrome completely. Re-open Chrome and use as normal. Open Internet Explorer to any webpage. This will bring up the Delete Browsing History pop-up window. Only check the box next to Cookies and website data. Once you click Delete, Internet Explorer will work in the background to clear this data. When it has completed, a bar will pop up along the bottom of your webpage to notify you. When you see that bar appear, close Internet Explorer completely and then re-open and use as normal. Open Edge to any webpage. This will bring up the Clear Browsing History menu. 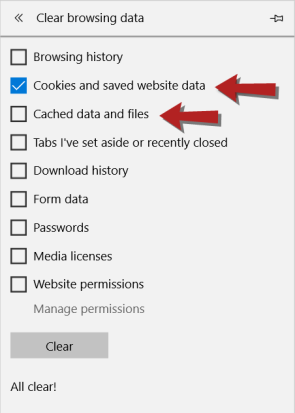 Only check the box next to Cookies and saved website data. Once you click Clear, Microsoft Edge will work in the background to clear this data. When it has completed, an "All Clear!" message will appear under the Clear button. When you see that bar appear, close Microsoft Edge completely and then re-open and use as normal. Open Firefox to any webpage. This will bring up the Clear Recent History pop-up window. Check the box next to Cookies. Firefox will work in the background to clear your data. It will not tell you when it is finished; simply wait a moment, then close Firefox completely. Re-open Firefox and use as normal. Open Safari to any webpage. 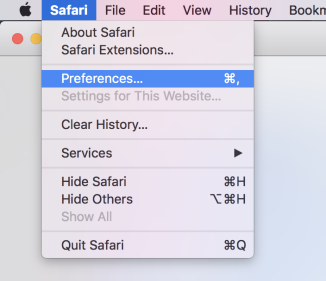 In the upper left-hand corner of your screen, click on Safari and then click on Preferences. In the Settings window make sure the Privacy option is selected. This will take you to a screen with all of your stored Cookies. You can either highlight the specific SchoolDude.com or FacilityDude.com cookies and click Remove or click Remove All. Click Remove Now in the confirmation pop-up window. Close Safari completely. Then you can re-open Safari and use as normal. From your home screen, tap on Settings ( ). From your list of Applications, tap on Safari. In the list of Safari settings, tap on Clear History and Website Data. This will bring up a prompt asking you to verify this step. Tap Clear History and Data. 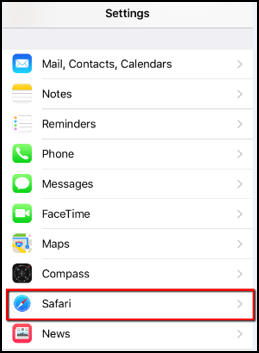 Close Safari by double tapping the Home button, then swiping up on your Safari window. Re-open and use Safari as normal. Tap the Chrome app on your device to open the web browser. Tap the menu icon ( ) and select Settings. Under the Advanced section, tap Privacy. Scroll down and tap Clear browsing data. Select All time from the Time Range drop down menu. 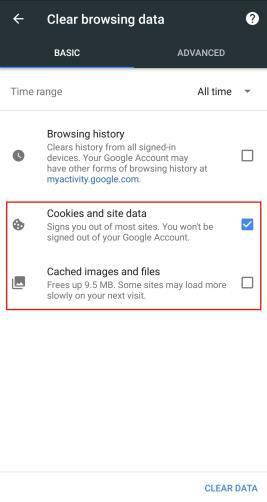 Make sure only Cookies and site data is checked and tap Clear Data. You may be prompted to select whether to clear data from particular sites. Uncheck any sites whose data you would like to keep, then tap Clear. 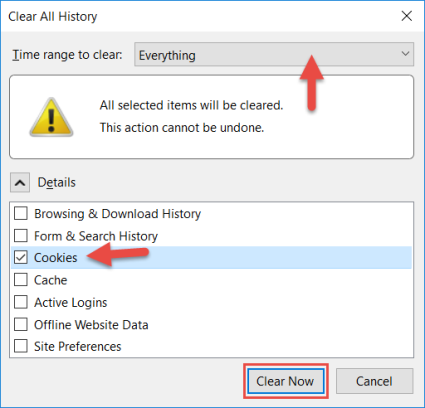 Once Chrome finishes clearing cookies, you can continue to use Chrome as normal.